Stores and Transports Hot Plates While Hot! Mountable or Portable storage and security system. Magnet security system. Shielded Storage System. Permanent Keeper. Security, Storage, and Transport System. Saves Teacher Time and Money. Just hand out the sheets and turn on the video. A security storage and transport system. Tired of not being able to transport hot plates immediately to the next class or to put hot plates away until they have cooled down? The HotplatewatcherTM, exclusively designed by CCS, is a storage, transportation and security system for hot plates made from a heat conducting metal screen and a hand crafted pine and plywood wooden frame. Students can now safely put the hot plates neatly away, or even take them off to the next class, immediately after use. The capacity is 6 plates (not 8 as shown) per tray with a specific location for each hot plate so if one is missing you can easily see. The trays stack on one another for easier transport and storage. 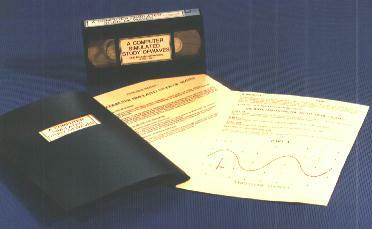 HotplatewatcherTM is approximately 25 cm X 40 cm in size. State diameter, height and manufacturer of your hot plates when ordering. Designed for easy storage, transport and security, the Gogglewatcher TM is instantly ready for student use. Its a proven security system for preventing loss or theft of safety goggles or glasses. Any goggles not returned are quickly detected. The GogglewatcherTM comes complete with handles, removable Plexiglas sliding doors and holes for optional wall mounting. 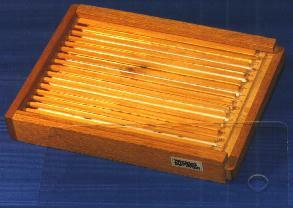 The handcrafted wooden box is made from pine. Plywood, for extra strength, is used for the compartments and backing. It has a 32 (class set) goggle capacity. The MagnetwatcherTM is a tested and proven security system preventing loss or theft of magnets. 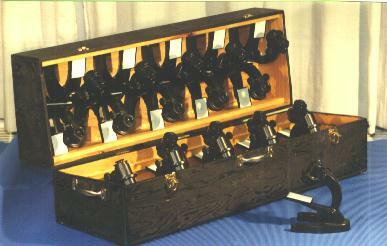 It is also designed for easy storage, transport and quick set up of magnets for student use. The especially designed tray allows the magnets to be easily flipped up for student use. It has a fool proof metal keeper system to maintain the magnetic field strength of each magnet. This metal inner shell also provides external shielding to protect from accidental erasure of magnetic disks and video tapes near by. 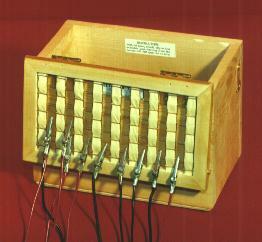 The handcrafted wooden box is made of pine and lined with ferromagnetic metal and stores up to 16 magnets at one time. "It's permanently attached to the wall in my lab & the kids use it when necessary ... it's just great "
The ThermowatcherTM is designed to save teacher time and prevent thermometer loss or damage. With easy teacher set up, and storage, it comes with a plastic self-hiding transparent lid. This allows the teacher to keep accurate count of the number of thermometers and the condition of the bulbs before, during and after lab use. The specially designed cross-grooved tray, allows the individual thermometers to flip up for easy access by a simple push of the student's finger. 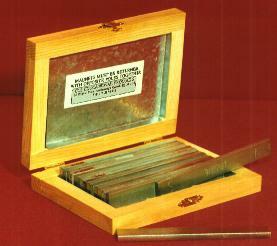 Up to 16 thermometers can be stored in each tray. As a security system, it comes complete with teacher and student instructions as well as student sign-up sheet. The ThermowatcherTM is handcrafted in pine, with drop resistant solid hard wood sides and is approximately 35 cm X 20 cm X 4 cm in size. 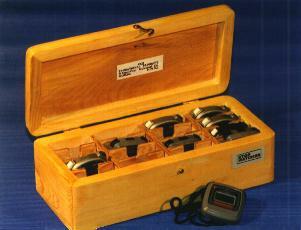 The STOPWATCHERTM is hand crafted from pine and stores up to 16 stopwatches. It pays for itself by preventing theft of watches but because of its convenience, you save time too! As part of the security system, it comes complete with teacher instructions, student instructions (in 2 versions), student sign-out sheet, and some suggestions of how to minimize all stopwatch loss. The Wavelength and the Amplitude of a Wave. The Wavelength and the Frequency of a Wave. Two Identical Waves and their Resultant. Two Different Waves and their Resultant. Two Similar Waves of Different Frequencies. This sturdy hand crafted wooden Alligator LeadsWatcher TM functions as a security, storage & transport system. 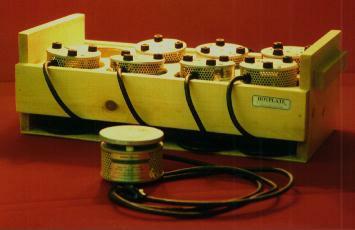 Both models holds up to 32 leads, with an obvious attachment location for each. One can instantly see if a lead is missing. UNIVERSAL MODEL is for your existing lead collection and works with all makes and sizes of leads with an alligator at one end. The specially designed lid opens flat down the back of the box to allow students to take or replace leads easily. 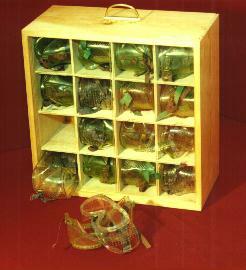 When finished, the lid is closed (picture shows closing lid by guiding the leads to the inside) for storage or transport. (shown on left)COMPLETE KIT comes with leads. The kit has 8 one foot, 16 one & a half foot, & 8 two foot lengths half black and half red. These fit precisely, attaching at both ends in their own security groove, ready for storage or transport. Student explaining to the teacher: "I used the long wires to prevent the short circuit." This sturdy hinged Microslide viewerwatcherTM is a wooden box functioning as a security system as well as a storage & transport system. It holds up to 16 microstrip viewers, each with their designated spot, so that one can instantly see if a viewer is missing. The lid opens out flat to allow students to put viewers in and out easily. With nestled storage in both lid and base, storage space is reduced considerably. The lid is cut on an angle to take full advantage of locating the carry handle at the centre of gravity allowing for easy transport. Wheels optional. Size is approximately 27 cm X 27 cm X 60 cm. The STAPLERWATCHERTM is made from a sturdy corner re-enforced metal and can take the pounding kids are sure to supply. It pays for itself by preventing stapler theft but more important than that, saves you time! You will never be asked "Where's the stapler?" again. The plastic finishing pop-on skirt comes in two colours white or black. 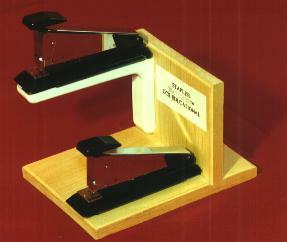 The Apsco Model 2002 Stapler comes attached to the STAPLERWATCHERTM and is ready for easy mounting with the 2 screws supplied. A model for table top mount (not shown) is also available. State colour of plastic skirt black or white & stapler black or putty.